This example shows how to use the Robust Control Toolbox™ command ucover to model a family of LTI responses as an uncertain system. This command is useful to fit an uncertain model to a set of frequency responses representative of the system variability, or to reduce the complexity of an existing uncertain model to facilitate the synthesis of robust controllers with dksyn. In this first example, we have a family of models describing the plant behavior under various operating conditions. The nominal plant model is a first-order unstable system. The other models are variations of Pnom. They all have a single unstable pole but the location of this pole may vary with the operating condition. To apply robust control tools, we can replace this set of models with a single uncertain plant model whose range of behaviors includes p1 through p6. This is one use of the command ucover. This command takes an array of LTI models Parray and a nominal model Pnom and models the difference Parray-Pnom as multiplicative uncertainty in the system dynamics. where all uncertainty is concentrated in the "unmodeled dynamics" Delta (a ultidyn object). 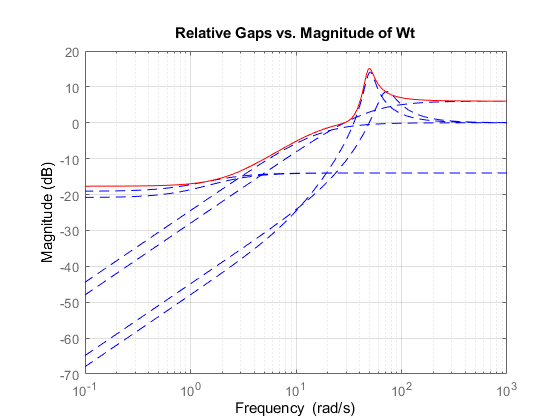 Because the gain of Delta is uniformly bounded by 1 at all frequencies, a "shaping" filter Wt is used to capture how the relative amount of uncertainty varies with frequency. This filter is also referred to as the uncertainty weighting function. You can now use the uncertain model P to design a robust controller for the original family of plant models, see Simultaneous Stabilization Using Robust Control for details. A collection of step responses illustrates the plant variability. The uncertain plant model P contains 3 uncertain elements. For control design purposes, it is often desirable to simplify this uncertainty model while approximately retaining its overall variability. This is another use of the command ucover. 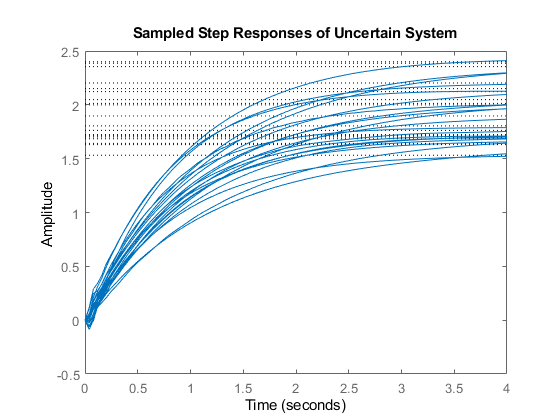 Next, use ucover to cover all behaviors in Parray by a simple uncertainty model Usys. Choose the nominal value of P as center of the cover, and use a 2nd-order filter to model the frequency distribution of the unmodeled dynamics. 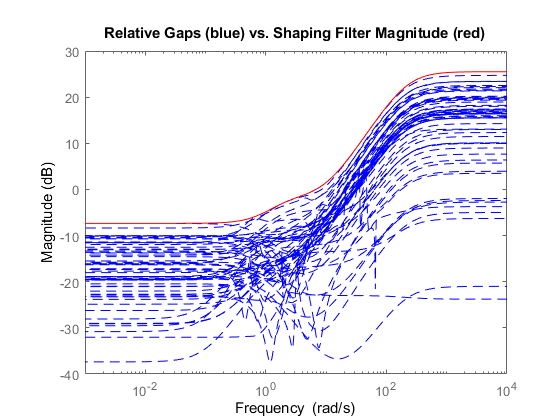 A Bode magnitude plot shows how the filter magnitude (in red) "covers" the relative variability of the plant frequency response (in blue). 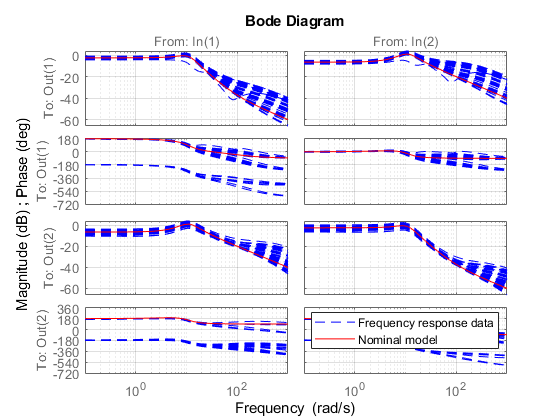 You can now use the simplified uncertainty model Usys to design a robust controller for the original plant, see First-Cut Robust Design for details. 40x1 array of FRD models. Each model has 2 outputs, 2 inputs, and 120 frequency points. Plot this data and superimpose the nominal model. 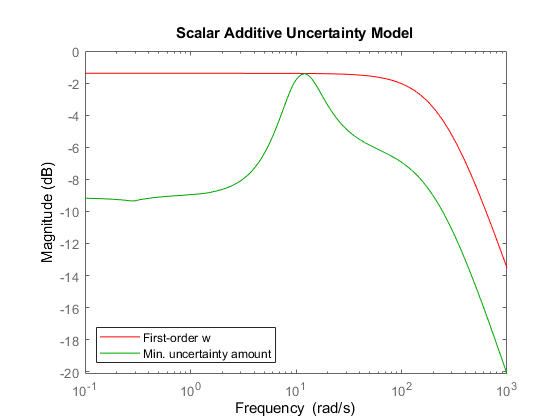 where Delta is a 2-by-2 ultidyn object representing the unmodeled dynamics and w is a scalar weighting function reflecting the frequency distribution of the uncertainty (variability in Pdata). The magnitude of w should closely match the minimum uncertainty amount. It is clear that the first-order fit is too conservative and exceeds this minimum amount at most frequencies. Try again with a third-order filter w. For speed, reuse the data in InfoS1 to avoid recomputing the optimal uncertainty scaling at each frequency. The magnitude of w now closely matches the minimum uncertainty amount. Among additive uncertainty models, P3 provides a tight cover of the behaviors in Pdata. Note that P3 has a total of 8 states (2 from the nominal part and 6 from w). Uncertain continuous-time state-space model with 2 outputs, 2 inputs, 8 states. Type "P3.NominalValue" to see the nominal value, "get(P3)" to see all properties, and "P3.Uncertainty" to interact with the uncertain elements. where W1 and W2 are 2-by-2 diagonal filters. In this example, restrict use W2=1 and allow both diagonal entries of W1 to be third order. Compare the two entries of W1 with the minimum uncertainty amount computed earlier. 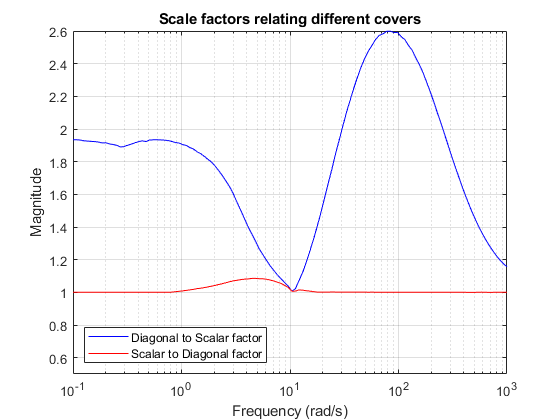 Note that at all frequencies, one of the diagonal entries of W1 has magnitude much smaller than the scalar filter w. This suggests that the diagonally-weighted uncertainty model yields a less conservative cover of the frequency response family. These quantities measure by how much one uncertainty model needs to be scaled to cover the other. 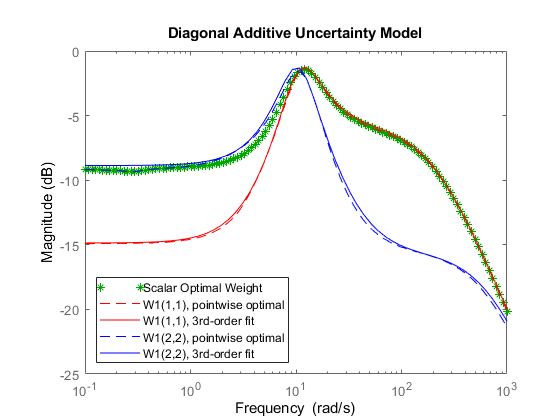 For example, the uncertainty model Pnom + W1*Delta needs to be enlarged by a factor Fd2s to include all of the models represented by the uncertain model Pnom + w*Delta. Plot Fd2s and Fs2d as a function of frequency. In that same frequency range, Pnom+W1*Delta does not include all of the behaviors modeled by Pnom+w*Delta and, in fact, would need to be enlarged by a factor between 1.2 and 2.6 in order to do so. In the frequency range [1 20], neither uncertainty model contains the other, but at all frequencies, making Pnom+W1*Delta cover Pnom+w*Delta requires a much smaller scaling factor than the converse. This indicates that the Pnom+W1*Delta model provides a less conservative cover of the frequency response data in Pdata.